Abstract. Free-drifting sediment net traps were deployed 14 times at depths between 80 and 500m for 1–3 days each during the late monsoon–intermonsoon transition in the central Arabian Sea. Two locations (19.5 and 15.5°N) were within the permanently oxygen-deficient zone (ODZ), and a third (11°N) had a shallow and thin oxygen minimum. The secondary nitrite maximum, which serves as a tracer of the ODZ, thinned from ∼ 250m thick at stations 19.5 and 15.5°N to ∼ 50m thick at station 11°N. 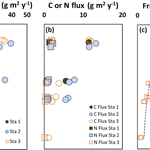 Overall, organic carbon fluxes ranged from 13.2gm2yr−1 at 80m to a minimum of 1.1gm2yr−1 at 500m. Fluxes at the more oxygenated 11°N station attenuate faster than within the permanent ODZ. Martin curve attenuation coefficients for 19.5 and 15.5°N are respectively 0.59 and 0.63 and for 11°N it is 0.98. At least six potential mechanisms might explain why particles sinking through the ODZ are more effectively transferred to depth: (M1) oxygen effects, (M2) microbial loop efficiencies and chemoautotrophy, (M3) changes in zooplankton dynamics, (M4) additions of ballast that might sorb and protect organic matter from decay (M4a) or change sinking speeds (M4b), (M5) inputs of refractory organic matter and (M6) temperature effects. These mechanisms are intertwined, and they were explored using a combination of mineral (XPS) and organic matter characterizations of the sinking material, shipboard incubation experiments, and evaluations of existing literature. Direct evidence was found supporting an oxygen effect and/or changes in the efficiency of the microbial loop including the addition of chemoautotrophic carbon to the sinking flux in the upper 500m. Less direct evidence was found for the other potential mechanisms. A simple conceptual model consistent with our and other recent data suggests that the upper ODZ microbial community determines the initial flux attenuation, and that zooplankton and sinking speed become more important deeper in the water column. The exact interplay between the various mechanisms remains to be further evaluated. How to cite: Keil, R. G., Neibauer, J. A., Biladeau, C., van der Elst, K., and Devol, A. H.: A multiproxy approach to understanding the "enhanced" flux of organic matter through the oxygen-deficient waters of the Arabian Sea, Biogeosciences, 13, 2077-2092, https://doi.org/10.5194/bg-13-2077-2016, 2016.